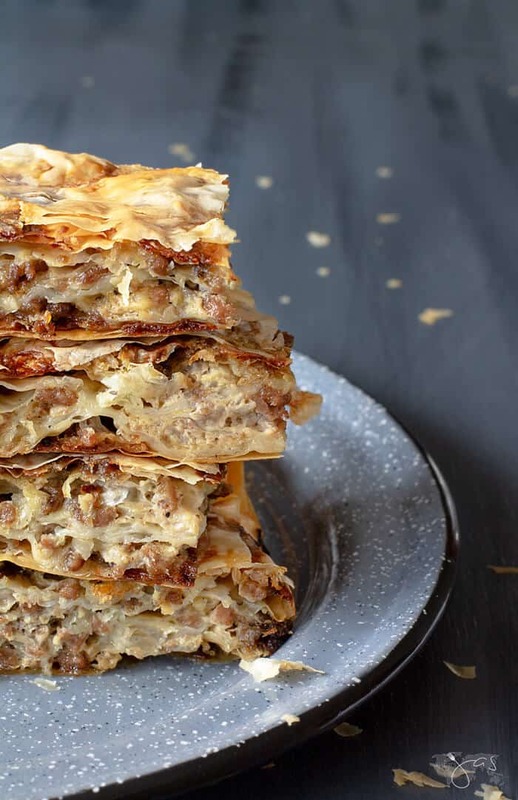 This step-by-step recipe for layered burek – fillo meat pie is perfect for when you’re first starting cooking with fillo dough. It’s a fuss-free, easy process that will eliminate your fear of making fillo dishes for good. Check baking with fillo off your bucket list now! Tackling and succeeding in something new is always so rewarding especially when the outcome is as delicious as the meat filling between the layers of fillo pastry. 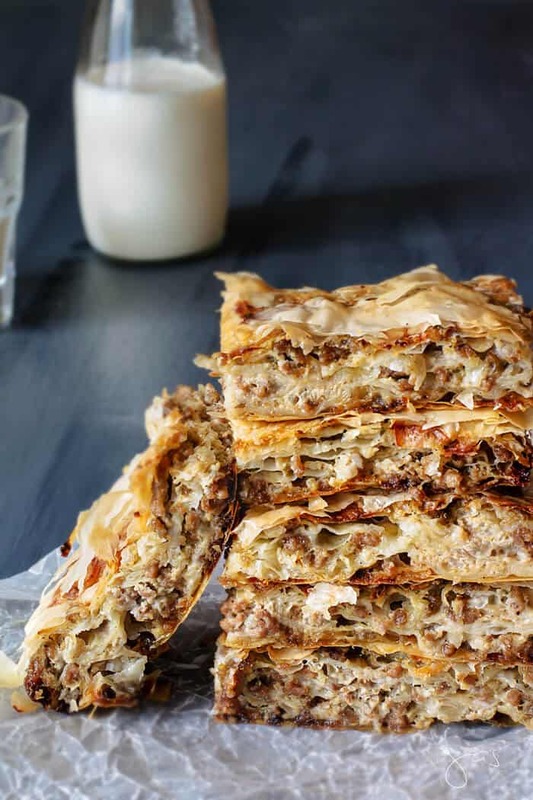 I promise you’ll be making this meat pie aka burek again and again! Savory fillings baked in thin flaky pastry dough known as fillo, filo, phyllo or yufka are popular throughout southeastern Europe, one of many legacies of Ottoman Empire. Stretching raw dough into paper-thin sheets likely originated in the kitchens of the Topkapı Palace in Turkey, during the time of their 400+ years of ruling. Do you ever wonder who was the very first person (or a team of people) that came up with dough and then thought of stretching it so thin you can almost see through it? I spend many sleepless nights thinking of origins of food and other amazing things that make our world. Doesn’t everyone? 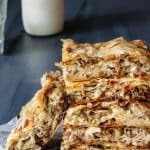 How to make layered burek with fillo pastry? First, clean a large working surface. Next, prepare your filling (full recipe below), then melt the butter or get oil ready, and grease the baking dish. Lastly, open the package with thawed fillo dough. Keep the dough covered with a barely damp towel to prevent from drying out. Handle the thin sheets gently but don’t worry if they tear. Once baked, it won’t be visible. Layer a couple of sheets of fillo into the prepared pan and drizzle with oil. Spread some of the meat filling on top of the pastry sheet and repeat layering until the filling is used up. 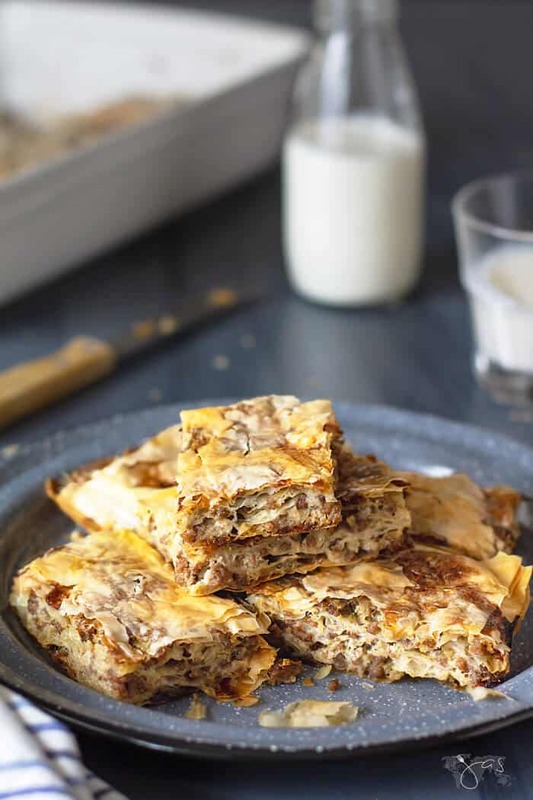 Every country of the Balkan region and region within a country is proud of their version of burek. You might remember Albanian burek recipe guest posted by a young cook a while back. Burek, the meat pie, is one of the Bosnian favorite national meals. 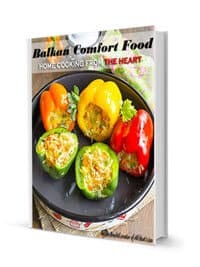 Using commercially produced fillo dough is almost an insult to a true Bosnian, but who has time to make it from scratch? Not me, although I do know how to make this paper-thin dough. 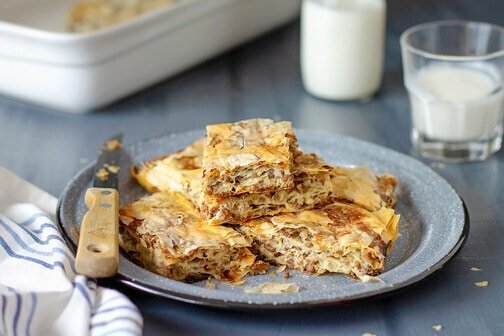 We think of Greece when we hear fillo, especially baklava and spanakopita, although fillo and those dishes are traditional to all Balkan countries. Where to buy fillo dough? 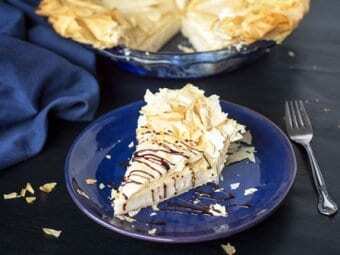 Your local grocery stores most likely carry fillo pastry in the refrigerator with pie crusts. They often don’t stock enough though, but fear not! You can easily order them online directly from The Fillo Factory. The best part is, there are varieties of fillo dough you can choose from. 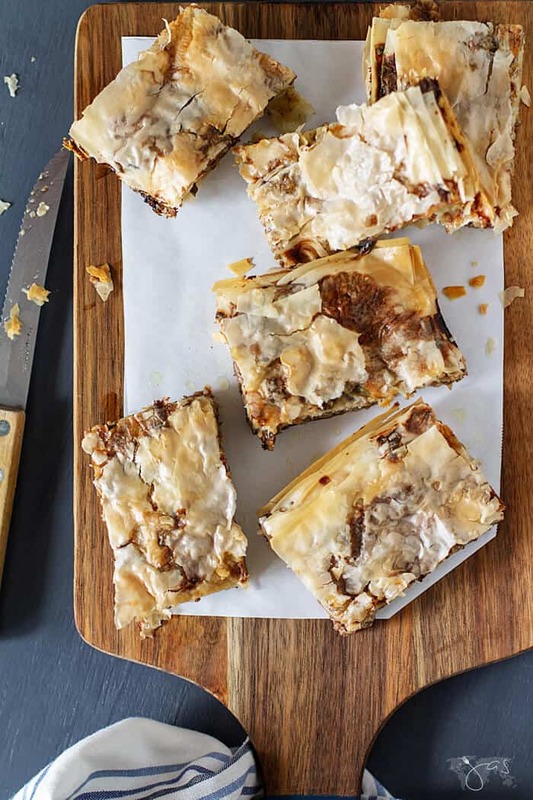 I suggest thinner pastry for baklava and all the others are good for various savory recipes unless otherwise specified. I know you will love them so go ahead and order a few. They ship frozen and will keep great in your freezer for months! Interesting fact: There is an ongoing dispute amongst my fellow countrymen when it comes to the name of various fillo pies. No matter the filling, we call stuffed fillo dough a pie, aka pita. But now it gets more complicated: if the filling is meat, then the pie is called burek. Cheese, spinach, potato, zucchini, and even apple and sugar cream fillings are merely called “[the name of the filling] pita”. Try replacing onions with leeks for a different hint of flavor. Sauté onions in a large skillet over medium-high heat until translucent, about 3-4 minutes. Do not overcook them; they’ll finish cooking in the oven. Add ground beef, garlic, Vegeta if using, salt, and pepper. Simmer for 15 minutes and let cool. Beat the eggs with sour cream and mix with the ground beef and onion mixture. Preheat oven to 375 degrees Fahrenheit. Grease a 9×13 baking pan generously with oil. 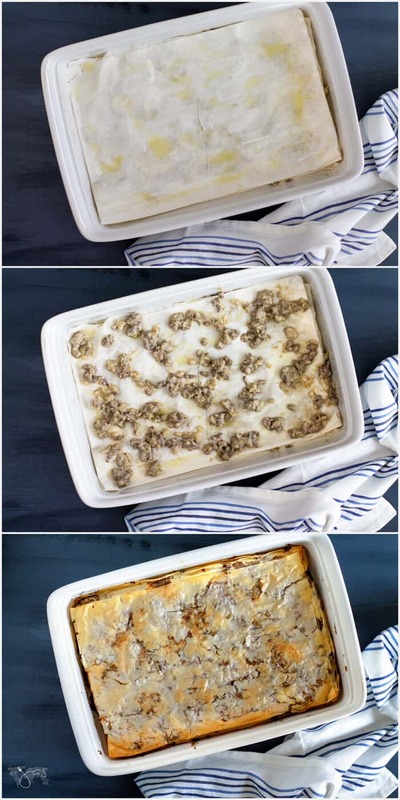 Lay the thawed phyllo dough sheets between two lightly damp kitchen towels. Place two (three if extra thin) sheets of fillo dough into the prepared pan. Fold any excess dough in or cut with scissors. Brush or drizzle the top sheet with oil. Spread some of the meat filling evenly over the fillo, about 3 tablespoons. Repeat the layering process until the filling is used up, finishing with two-three layers of fillo. Brush the top of the pastry generously with remaining oil. 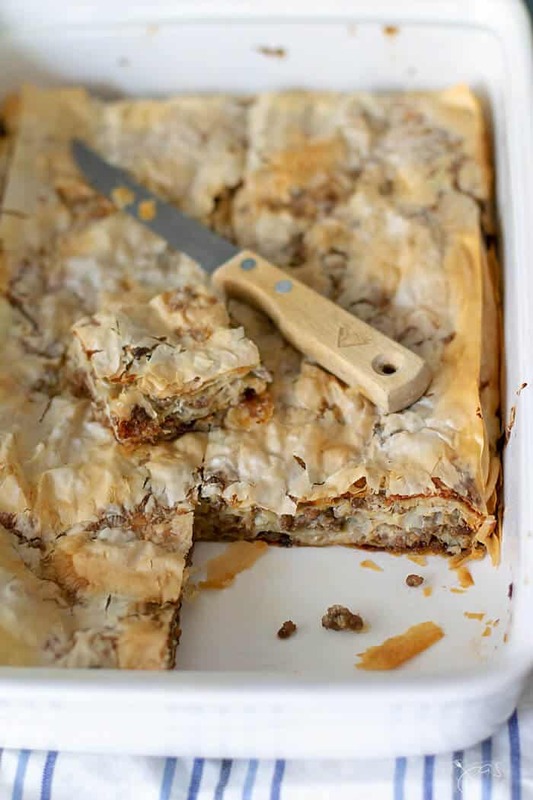 With a sharp knife, cut the phyllo pie into squares. Bake for 45-60 minutes, or until cooked through and golden brown in color. Serve with buttermilk or Balkan style yogurt (like Greek) for authenticity. Step by step recipe to a crispy, flaky, golden fillo meat pie for the entire family to enjoy. Preheat oven to 375 degrees Fahrenheit. Grease a 9x13 baking pan generously with oil. This sounds delicious! I can’t wait to try to make it myself! Thanks for sharing! That makes two of us, Antonia 😀 Thanks for visiting! Beautiful dish and such a fun share, Jas! Thanks for bringing your dish to Fiesta Friday! Ha, that’s awesome! Since you love burek, I know you will love this version too! Hope you’ll try it! Hugs! Jas this sounds like a very interesting recipe. I have never heard of this one before. 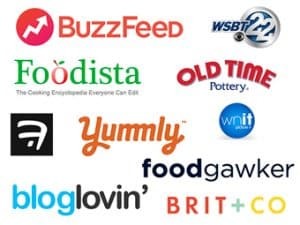 Anything that involves fillo is always a favorite in my house! I bought the Vegeta and two large onions. I just chopped one large onion and it looks about 3-4 cups. I’m a little wary about that being the correct amount. I hope you’re online and will respond to this soon. I’m holding off for a little while on proceeding until I hear from you about how many cups of onion I should use. Thanks! Hi, Diana! I guess there are large onions and then there are LARGE onions, lol. I should be more specific. 3-4 cups are OK since, in this version, they are sauteed first. We do love lots of onions in our dishes. Hope I’m not too late responding. Thanks for giving it a try, and let me know how you liked it! Thanks Jas. I went ahead with the one large onion i had previously chopped (I measured it to be a little more than 3 cups), which seemed like so much when I put it in pan, but it turned out to be just right. Recipe came out well. It was easy and tasty. My family liked it. Thanks! Ah, glad it turned out fine. Thank you so much for trying it and liking it! Hugs!